Body language-wise, Tuesday’s State of the Union address was shaping up to be the shadiest in history. 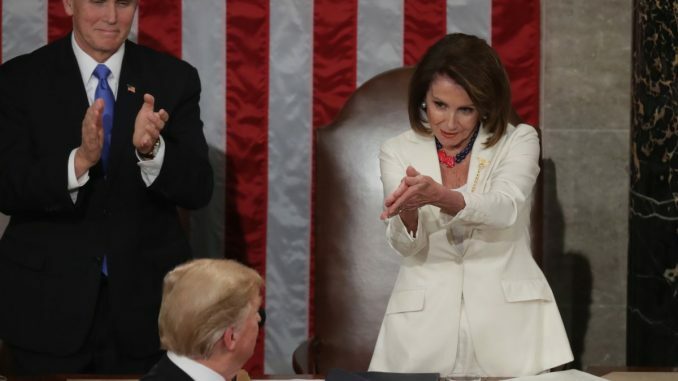 First, we had House Speaker Nancy Pelosi’s tepid handshake with Trump and her perfunctory golf claps. Then she pursed her lips and read (presumably a printout of his speech, although people on Twitter speculated it was everything from Michelle Obama’s memoir to Trump’s tax returns) for a long time. Other Democratic women in Congress also couldn’t veil their contempt for the pomp and circumstance of the event. Sen. Kirsten Gillibrand’s eye roll is going to get her some donations tonight. Alexandria Ocasio-Cortez and the rest of the Democratic women in the House — all sitting together wearing white — sat there quietly. No smiling. No standing. No clapping. Pretty much what you’d expect given that many of them have vowed to investigate and impeach him, an investigation that he called “ridiculous” and “partisan” in a particularly concerning portion of the address. Please just look at Pelosi’s face when he went on about the investigations. But then…something curious happened. As Trump began talking about the progress of women, citing that women filled 58% of the new jobs created in the past year, the Democratic women looked at each other as if to ask, “Is it okay to stand up now?” Then they started to stand up and cheer. Even AOC. And the thing is, their expressions looked like pure joy rather than perfunctory, official going-through-the-motions. The room erupted. All of the women stood again. The two parties briefly stood and cheered together, throwing off all the pent-up energy of the divisive time. Ivanka looked very pleased. Trump being Trump, he thought the cheering and unity among the women was about him. But it wasn’t. It was about celebrating each other. His words didn’t change the fact that he told a harmful lie about late-term abortion during the speech. Or the fact that there were parents who were separated from their children at the U.S.-Mexico border and transgender troops whom he had kicked out of the military in the audience. The women wearing white and Equal Rights Amendment pins didn’t forget. But they were tired of feeling sad and hopeless, so they chose joy in that moment.